Ever since my initial visit to Dosa Hut as part of the Taco Challenge (was a stretch that they made a dosa into a taco), I planned to go back. Since they were part of the Curry Challenge (yes, that makes much more sense), I was able to return along with Joyce to try out their entry. In addition, it afforded us the opportunity to order extra dishes to see if that first taste was as good as I had remembered. Well, at least we would attempt to eat the extra dishes as we had already visited Kaya Malay to try their entry beforehand. No matter, Joyce and I have done this eating thing for awhile and heck, we were gonna do our very best. 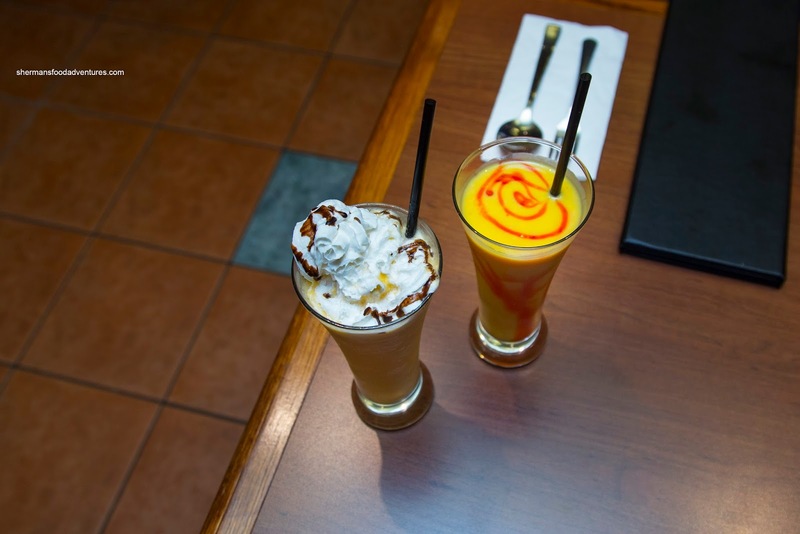 Before the food arrived, we were treated to a Mango Lassi and a Mango Milkshake. I thought the lassi was pretty good being just the right viscosity where it was neither too thick nor thin. It was sweet and had the true essence of mango. As for the shake, it was thick and tasted like mango ice cream. Right off the bat, we were served their Curry Challenge creation in the Attu Chops Iral Curry featuring a lamb Chop with dosa, nilgiri prawn with wild brown rice. Being a Chetinad-style curry, the flavour was a little different than the common Punjabi curries we find in the GVRD. It was thick and rich with a balanced spiciness that complimented the sweetness and background tang. The lamb chop itself was pull-apart tender. The meaty prawns were coated with a coriander and mint chutney that made things bright. 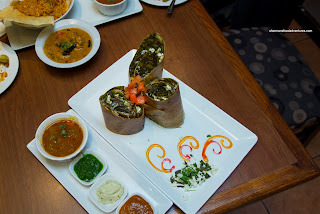 For our added dishes, we had another dosa in the form of the Palak Paneer Dosa plated quite fancily. With that being said, it ate even better than it appeared. 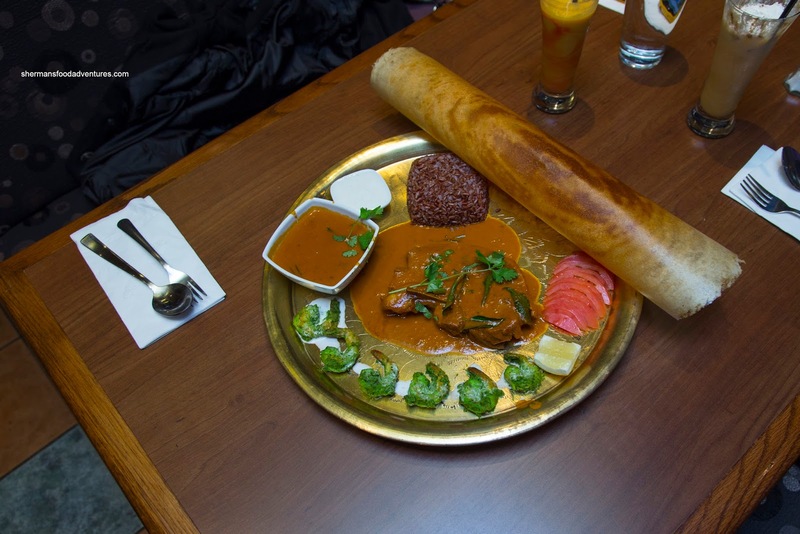 The dosa itself was crispy and light while still retaining a slight chewiness inside. The even smear of palak was slightly creamy while the globs of paneer were nicely cheesy. Interestingly, I thought the best accompaniment was not the chutneys that came with it, rather the raita from the other dish as it provided a creamy coolness. 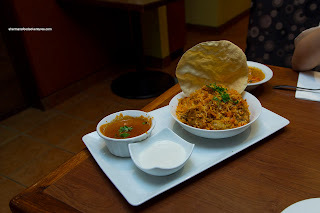 That other dish was the Chicken Biryani that was aromatic and impactful. The basmati rice was fluffy and chewy at the same time while blessed with the essence of saffron and a slight spice. The pieces of chicken were tender and almost juicy. 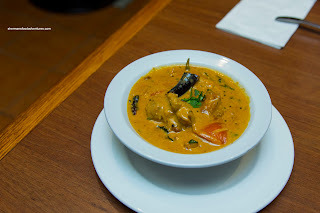 Lastly, we had the Chicken Korma which was fantastic in our opinion. Creamy, nutty and full-flavoured, this was mild in terms of spice (like it should be), but impactful nonetheless. The richness of the dish was not as heavy as it appeard and I really liked smoothness of the sauce. 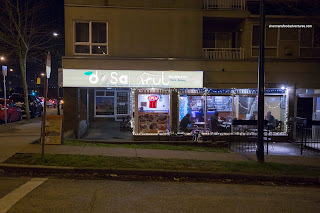 Overall, we were impressed with the quality of food served at the Dosa Hut. Flavours were apparent and textures were on point. Impressive for a small little joint out on Fraser Street.